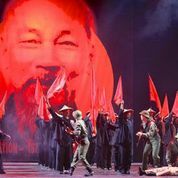 In 1991, Claude-Michel Schonberg and Alain Boublil (the team that brought us Les Mis) took Broadway by storm with their story of war, love and sacrifice in Miss Saigon, based on Puccini’s opera, Madame Butterfly. That show gets another update updated version in the latest tour, making just four stops including the one in Hartford, at the Bushnell, one of the production’s producers. Fred Hanson directs (Nicholas Hytner directed the original London and Broadway productions) with Musical Direction by Kevin Stites and Choreography by Baayork Lee, who was in the house opening night Tuesday. Towering sets (Michael Ananaia, design) featuring barbed wire, Asian accents and even a helicopter that hovers create War-torn Saigon just before the fall of Saigon and the pull-out of American troops in 1975. Disillusioned Chris (Charlie Brady) accompanies his buddy, John (Nkrumah Gatling), to Dreamland, a sleazy bar/brothel where The Engineer (Orville Mendoza), a French-Vietnamese opportunist sells booze and girls (played by Rona Figueroa, Jessica Wu, Anna-Lee Wright and Minami Yusui) in his quest to make big bucks and buy a Visa to America. His most lucrative gimmick: The Miss Saigon contest where GIs buy raffle tickets for a free night with the winner. When the Engineer presents his newest contestant, young, virginal Kim (Manna Nichols), Chris protects her from the advances of the other men and spends the night with her himself. She touches his wounded heart and the couple finds love for two weeks, even going through a marriage ceremony of sorts, before some things get in the way of their romance. First, Kim’s cousin, Thuy (Johnny Hsu Lee), an Army officer, returns to claim her. Their fathers had promised them in marriage when they were 13. Second, the city falls and Kim and Chris are separated during the evacuation when the troops pull out. Three years later, Kim and the Engineer find their way out of Viet Nam and the engineer starts another club in Bangkok while continuing his quest for a US visa. He connects with John, now working to help displaced refugees and orphans, who reunites them with Chris, but some surprises are in store. Chris has married Ellen (Meggie Cansler), who doesn’t know anything about Kim, except that her husband still calls out that name when he is tortured by nightmares. And Chris doesn’t know that he and Kim have a son, Tam (Daphne Zhang Valenta and Arianna L. Yi share the role. I saw Li who is the cutest little button of a kid you’ll ever see on stage). Kim is determined that Chris should take their son back to the states where he can have the future she has always wanted for him. He and Ellen aren’t sure that’s a great idea. This is a crisply choreographed production with a strong vocal cast. Nichols has a lovely voice (“I’d Give My Life for You” is lovely) and gives depth to Kim. We feel her shame, hope and despair. Brady lends a nice tenor to Chris and the duets with Kim (“Last Night of the World,” "Sun and Moon”) are nicely executed. Let’s face it, anything from this score is a pleasure to hear (it’s an operetta with original lyrics and added material by Richard Maltby, Jr.). Gatling and Cansler have their moments with solos as well. Even the rather repulsive character of the Engineer is made watchable by Mendoza’s playful take. Interrupting the flow are some rough changes between scenes and some flaws in the presentation of the book which doesn’t make it clear at first why Chris left Kim behind or that years have passed. We also never really understand where Ellen entered the picture and why Chris seems so unmoved by seeing Kim again. The production feels long at two hours and 40 minutes with an intermission. Miss Saigon runs at The Bushnel, 166 Capitol Ave., Hartford, through Sept. 22, Performances are Wednesday and Thursday: 7:30 pm; Fridays and Saturdays: 8 pm; Saturday at 2 pm; Sunday 1 and 6 pm. Tickets $29.50-$105.50. 860-987-5900; www.bushnell.org.